On the Always-Already of American Racism: Not all black people are criminals. Not all cops are bad. The text tells us: Not all cops are bad. Not all black people are criminals. Not all white people are racist. We read this well-meaning text. Of course, we don't want to resort to labeling; of course we don't. But when you think about the news, and perhaps your own limited personal experience, doesn't it seem like the ratio of bad cops to good cops is much higher than the ratio of black criminals to... wait a second, this series of statements is a racist construction to begin with. 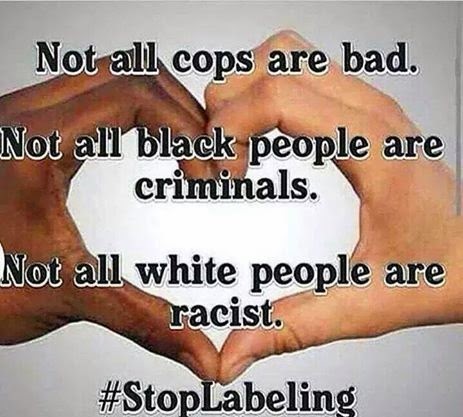 The categories offered are cops, black people, and white people, and bad cops, criminals, and racists; and this set-up already contains the subliminal, implicit suggestion that cops aren't black (statistically, this is not even possible, not anymore, but from a macro-perspective, unfortunately, it might as well be true) and--much more insidious--it suggests that blacks are criminals, even while it is trying to say exactly the opposite. If you want to tease this apart on your own--if you even can tease, or tweeze--these awful things apart, try to distinguish the difference between not all criminals are black and not all blacks are criminals. For the record, I happen to believe that all white people--and I'm speaking primarily of white people in the United States--are racist, but, though the brand of American Racism is special, we certainly aren't unique in the world in this regard. The sinister presence of Racism in our psychological, logical, linguistic, cultural make-up exists in us as individuals through the systemic status and quality of Racism in this country, where it has had a long, complex, and implicit history, and through the signal placement of white people within that structure, within those relations, discourses, possibilities, exclusions, and experiences. It behaves as a trait in a genetic code, not one that codes from our actual chromosomal DNA, but as the codes we absorb from the beginning by being raised in a culture of Racism, both explicit and implicit. This is what accounts for the construction that is ultimately racist in the well-intentioned text quoted at the outset of this post, which could have very easily been written by someone black as by someone white, though I'm banking on the latter, in this case. This fact of baseline American Racism doesn't meant that Racism--in others, in ourselves, and as it is enacted by The State--cannot be resisted, but I think that the de facto status and placement of white(s) within the environment of American privilege, possibility, and human worth underwrites expectations, investments, and meanings of which we are not even aware because the discourse itself is in us, is us, has always been in us and us, was taught to us, yes, but the discourse is tainted at its essence and has always already been tainted, long before we were immersed in it, by Racism, which exists as sometimes a command, sometimes an enraged explosion, sometimes a feeling of distaste, sometimes a knee-jerk reaction, sometimes an unnoticed current, a subtle drift, an undertow. We are not powerless to resist it, but we have to understand that it is there in order to resist it in the first place, all the same. How can you resist something that you don't believe--or don't know, or don't want to know--exists? I wholeheartedly believe that all people in the U.S. are bigots. I don't think you can be raised in this culture and not be--too many messages bombarding you from your earliest memories. It is incumbent on us to recognize that fact, and consciously try not to be racist. We may not be able to help the thoughts that come into our heads, but we can control how what we do affects other people. I entirely endorse and agree with this view. I agree that if we widen the frame to discuss bigotry and/or prejudice, that view will encompass everyone in the United States. And while I would prefer each individual examine her or his assumptions and real-world, real-time reactions and behaviors with regard to other people, to understand better that and how his or her unreconstructed, unthinking thoughts, words, and deeds do affect others, it seems clear that many enjoy the negative effect they produce in the other, that they seek that effect, as well as that affect. It is not that they don't care if they humiliate or hurt someone else: they do care: they care to do precisely that; they prefer to hurt someone else, and that action, that effect, brings them pleasure, power, and the pleasure that is power. This activity, this desire, happens across ethnic groups; it obeys no national boundaries; it seems to be intensified, rather than muted by religious affiliation (though the converse, one would think, should be the case); it crosses time and space, languages, communities, hues of skin tone, hair color and texture, height, weight, gender, sexuality, performativity, age, and any and every possible distinguishing trait or feature that humans can come up with to mark another as the other, as different, weird, foreign, or just not-them, and so reject him--abject him. We don't just fear the unfamiliar, we need it. We need the unfamiliar--the not-me, the not-us--for its use-value in order to be ourselves, to differentiate ourselves from the other, and we need it because--and this is the pessimistic view, but I am afraid that it's true--we need it because we like hurting others. As my friend, Lisa, says, the test is whether we give in to that desire to mark, distinguish, reject, abject, and hurt the other or not. We don't have to, though in many cases someone is literally trying to make us do just that. I would like to distinguish this event and desire from Racism, which belongs to the category of bigotry, though all bigotry is not Racism. Racism is not just fear of difference, it is a systematized, large-scale, cultural, historical effort--a national effort--against a particular kind of individual, against a certain group. And about this group the racism has very specific ideas about what should be available--socially, financially, educationally, conceptually, semantically, and materially--to that group and the individuals who have comprised it, and who comprise it, both now, and in the future, and the future of their children. This is not a conspiracy, as such (but, yes, of course, it is; in many cases it is entirely an agreed upon program that doesn't need to be discussed, though it is discussed, here, and there), in which those in power, and especially those not in power, specifically collaborate against the humanity and advancement of a whole group, but it might as well be. Racism is less a program than it is a fucked-up disease of a culture--in a culture--on a scale and pervasiveness bigotry only wishes it could attain. Racism is the child of bigotry. Racism is the perfectest example of bigotry. Racism is the god bigotry prays to.